No matter how comprehensive your website is, your visitors will inevitably ask questions. It’s best to answer those questions as quickly as possible, but you won’t always be available. That’s where using WordPress chatbots can come in handy. You’ve probably seen chatbots on other websites – programs that can carry out basic conversations through text. While this may seem like a complex feature, adding a chatbot to your own site is surprisingly easy. You just need the right tool. In this article, we’ll explain how chatbots work and how they might be able to benefit your WordPress site. Then we’ll introduce some tools for adding WordPress chatbots, and show you how to start using them. Let’s go! For your website, you can think of chatbots as an automated alternative to live chat. If you’ve ever had a ‘conversation’ with Apple’s Siri, Amazon’s Alexa, Microsoft’s Cortana, or Google Assistant, you’ve interacted with a chatbot. Also commonly referred to as a virtual assistant, a chatbot is a piece of software designed to mimic human speech and simulate conversations. Chatbots process input from their users – statements, questions, and so on – and reply with the most relevant answer they have access to. Some chatbots are entirely pre-programmed, set up with lists of responses they can give and the words or phrases that will trigger each one. Others are designed to do a little of the work themselves, like searching the internet for the correct answer or even learning over time. Most work through a text-based chat system, although some can also understand audio inputs. Provide better customer service, even when there are no humans around to answer questions. Direct visitors towards important information or a Call To Action (CTA). Collect data from your audience. Introduce an element of fun and personality into your website. 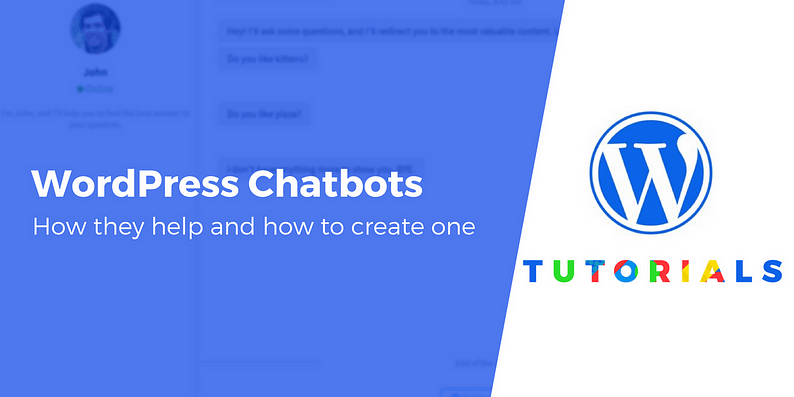 Chatbots can provide a lot of benefits for your site, and it’s actually surprisingly easy to create WordPress chatbots thanks to some helpful tools. First up, we have Botsify. This tool is simple to use, even for beginners. There’s a drag-and-drop designer that makes building your chatbot interface simple, and plenty of analytics options to help you refine your WordPress chatbots over time. 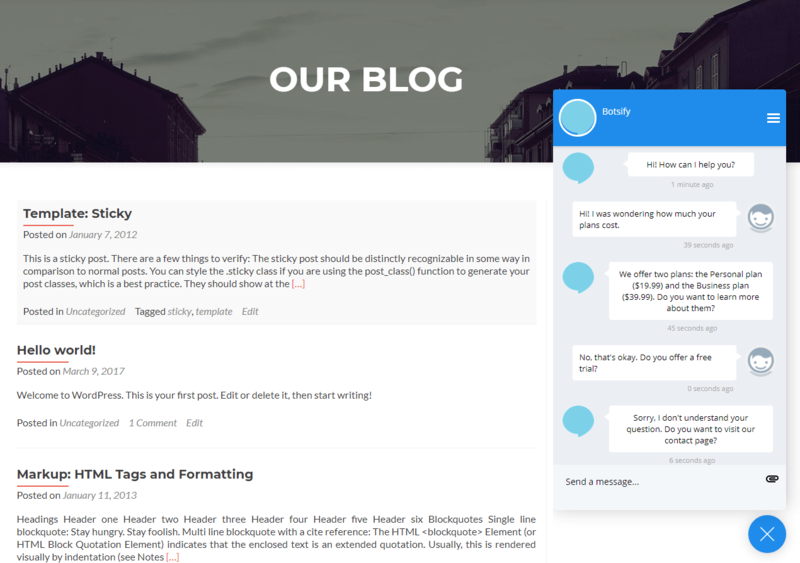 What’s more, Botsify makes it easy to integrate your chatbot with WordPress. However, you will need one of the paid plans to create a website chatbot. WP Chatbot is one of the few chatbot plugins designed specifically for WordPress. You’ll build your chatbot using the standard WordPress editor, with a few new options. WP Chatbot is also fully responsive and offers multiple design options. This is a premium plugin that costs $30 for a standard license. This solution offers both free and paid tiers, and enables you to build a chatbot with complex functionality. It will be able to understand when users switch topics or provide multiple pieces of information in one exchange, and respond appropriately. You can use this tool to create WordPress chatbots using the IBM Watson Assistant plugin, which has few active installs but excellent reviews. Once you’ve chosen the right solution for your site, all that’s left to do is actually create your chatbot. How this works will vary depending on the platform you’re using, but let’s look at one example. In this section, we’re going to show you how to create a chatbot using Botsify. We’ve chosen this platform because it’s simple to get started with, and doesn’t require using a plugin. As we mentioned, you will need a paid account to create WordPress chatbots with Botsify. However, you can easily try the tool out via the free trial. After signing up, you’ll be sent an email with instructions on how to get started. You can also use the Default message section to input a generic response the chatbot will use whenever someone asks a question it doesn’t understand. Each ‘story’ is made up of one or more potential user inputs, and a response from the chatbot. You simply enter keywords or phrases into the User says field, and then type the desired reply into the Bot says field. You can even add alternate responses, so the chatbot replies a little differently each time someone asks it the same question. It’s worth noting that most chatbot tools work in a very similar fashion. So if Botsify isn’t to your liking, you’ll already be a step ahead when you try out another solution. Adding a chatbot to your website is a little like hiring a part-time employee. Your chatbot can welcome visitors, answer some of their basic questions, and direct them to wherever they need to go (such as your contact page). This is a smart, easy way to improve the user experience on your site. Botsify: A reasonably-priced, flexible chatbot tool that is easy to get started with. WP Chatbot: A premium WordPress plugin that simplifies adding a chatbot to your site. Watson Assistant: A more advanced option with a lot of functionality and analytics options. Do you have any questions about how to use WordPress chatbots effectively? Drop us a line in the comments section below!